symptoms to prescribe appropriate treatments. increased interest in machine learning systems. Other reasons for the increased momentum include: maturing capabilities with methods and algorithms refactored to run in memory; the reduced cost of abundant computing power; and the simple fact that there is more data for computers to learn from. This paper is based on presentations given over the last few years. 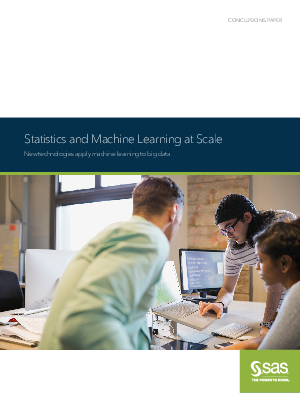 Wayne Thompson, Manager of Data Science Technologies at SAS, introduces key machine learning concepts, explains the correlation between statistics and machine learning, and describes SAS® solutions that enable machine learning at scale.